One of the benefits of a zero-based budget is learning where the money goes. You know at a high level, but it’s easy to overlook minor expenditures unless they are tracked. After a few months I learned we spend a lot on our cat and dog and frankly the dog is the lion’s share of the expense. Charger (have I mentioned how much I love football) is a lot of fun but he’s expensive. 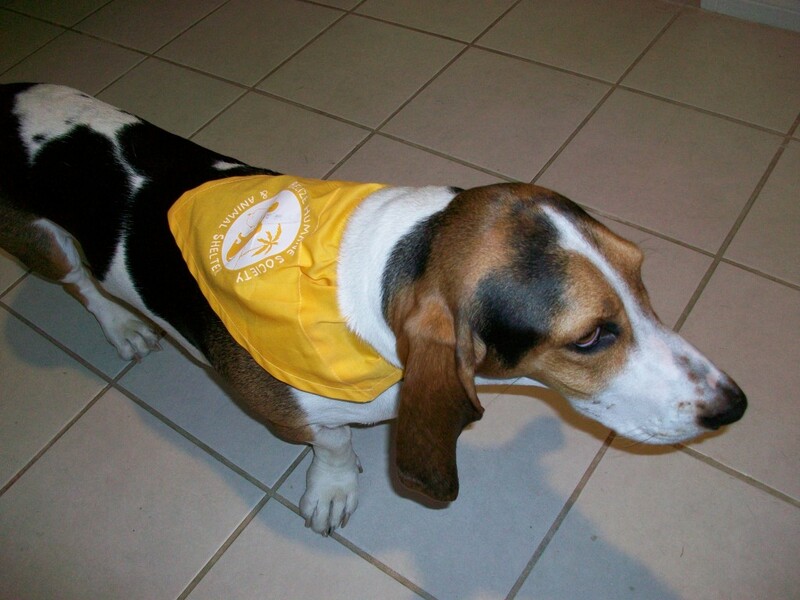 The $5 bandanna he’s wearing above from the Belize Humane Society is the least of it. This was our initiation into the cost of dog ownership and basset hounds are pretty low on the cost scale of purebreds. This is the breed of dogs my family had when I was growing up and for sentimental reasons it was my first choice. Next time I plan to get a lower cost dog as AKC registration isn’t meaningful if not breeding. Purchase of dogs (whether pound or purebred) can range from free to over $1500. Our was $400. As with human babies puppies need several wellness checkups their first year. Vaccinations are given at at least 3 visits and then there is the spaying/neutering cost bringing the first year total between $500-700. There are programs for low-cost vaccinations and sterilization in most communities. Ongoing Charger has a yearly checkup where he gets booster vaccinations. He gets a prescription for heart worm preventative which is given monthly. This costs $100 a year. Because of the year round mild weather (no, I’m not complaining) fleas never disappear and both animals are dosed monthly. I buy this medication at Amazon.com for an annual cost of about $105 for Charger alone. You never know when an illness or injury will result in needing veterinary care. Charger has needed care a couple of times for illnesses resulting in bills each time between $100-300. I am picky about Charger’s food eliminating any type with fillers. This meant we were buying premium food from the pet store. Then I discovered the equivalent product under the Kirkland brand name at Costco. Even with these savings we spent just over $60 last weekend stocking up on canned, dry and snack dog food products for a two month period. The live-in son takes care of the cat when we take a solo vacation. The dog needs to be taken out several times a day which he can’t due when at school or work. We found a good kennel for Charger that isn’t $40 plus a day. We have boarded him anywhere from 8-17 days at $24 a day (and that includes heated/air conditioned enclosure). This is where we save money compared to some other breeds. We give Charger monthly baths and keep him clean in between. I even brush his teeth. Neither one of us can handle clipping his nails. I cut too far down once and am forever scarred. So once a quarter he goes to the local Petco groomers to get his nails clipped and ears cleaned (important for bassets). This is the category where those little things (like the Belize souvenir) fall into. Dogs love toys, especially squeaky ones, and mine is no exception. He also loves to destroy them so regular replacement is necessary. Pet waste bags are an ongoing expense that can range from $3-6 for one hundred bags until we just found them a couple of months ag at the 99 cent store. We don’t celebrate his birthday but Charger does get a stocking with snacks and toys from Santa. Once in a while collars, leashes and dishes need to be replaced. The responsibility of owning a dog costs us about $800 a year in ongoing expenses. The annual cost will vary based on the breed, location and choices. Knowing the cost now doesn’t change a thing. The joy and love we get from dog ownership is well worth having this family member. Before adding a pet think about all the costs other than the one-time purchase. Your pet deserves it. I have adopted three rescue dogs that were abandoned by their previous owners. They are the most charming creatures I have ever known. It is lousy how some individuals treat animals like belongings or worse. My hope is that more people will get advised about this subject. Miranda, your work is amazing; but pretty heartbreaking. Thank you for looking out for man’s best friend. We have two labs. They eat us out of house and home! I always joke that we have “too many doggies” 😉 my hubby doesn’t think it’s as funny. Your puppy is cute! Labs are wonderful dogs, but boy do they have energy! Thanks for the compliment on Charger; we think he’s adorable (not that we’re biased or anything). We have a red poodle. Unfortunately, I do not have any inclination to learn to groom a poodle. And I’m not talking about the fluffy cut, just plain shaving and shorting the curly fur..so grooming is gone every 5 weeks.. which adds up! Yes, those poodles need a lot more grooming than my dog. At least you don’t have the shedding issue. I can’t let the dog near me unless I’m willing to change clothes right now. With 80 plus degree temperatures this weekend he’s shedding big time. Our schnauzer just had another expense add to her “cost per year”– the cone of shame! But God Bless her- she’s still crazy cute. .-= KateÂ´s last blog ..National Pancake Day =-. Kate, thanks for stopping by on SITS Saturday. Poor schnauzer with her cone of shame!